I consider myself an “active” person so when I joined up with VBT Bicycling and Walking Vacations “active” bike tour in the Croatia’s Dalmatian Islands, I thought it’d be no sweat. But to my surprise, there was a bit of sweat…in the best way possible. We grinded our gears up steady inclines and we flew down cliffs, but all the while, we were gliding by lavender scented hills and the glittering Adriatic. Uphill or downhill, what remained constant was the feeling of being so alive and present each moment in this country. The View from the top of the hill in Brac! I have to admit, when I travel, it’s usually go-go-go the entire time. I don’t have a lot of time to actually breathe in and be completely present in the moment as I always have to think about the next stop, shoot, line etc. However, on this particular trip, I traded a car for a bike, and my mind was forced to focus only on the immediate. Pushing those pedals and cresting that hill (or if you are like me, trying to take a photo and bike at the same time) took up pretty much all of my brainpower and in doing so, allowed me to immerse in Croatia in a new day. The rolling, drop-dead gorgeous rolling hills of Istria provided the perfect terrain for a warm-up ride. Our energetic guide Marco, led us on natural mountain trails, with a backdrop so stunning, we all had to make frequent stops for photo opportunities. The Istrian topography was ideally suited for the pace of bike travel: gently sloping green hills with bike paths between villages evenly spaced so you can have breakfast in one and lunch in the other. 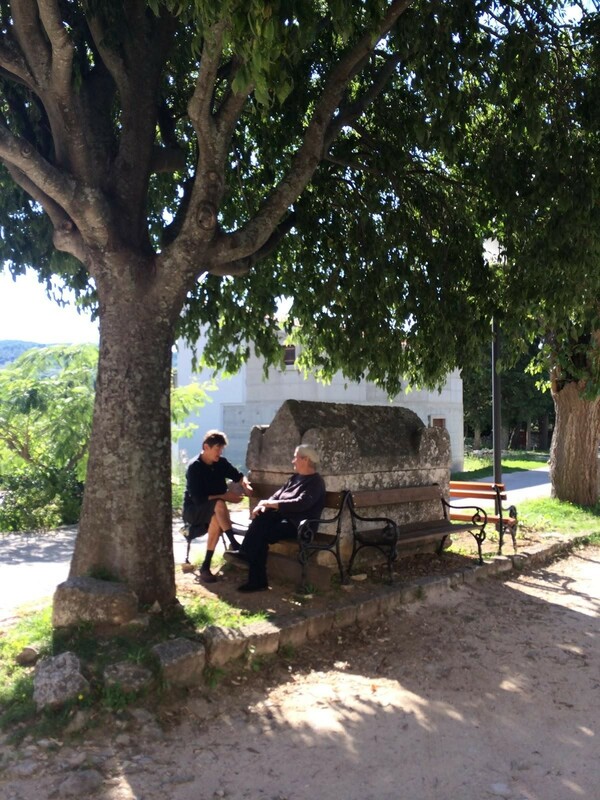 And believe me, you will want to too, as these Istrian villages off world-class food– fragrant truffles, wild meats, the sweetest honeys, rich olive oil and local Istrian wines. But this sweet first day of biking and eating in Istria, was just the introduction of active adventure. Before we knew it we were onto the next stop and we had touched down in Split: Croatia’s vivacious and historic portside town. 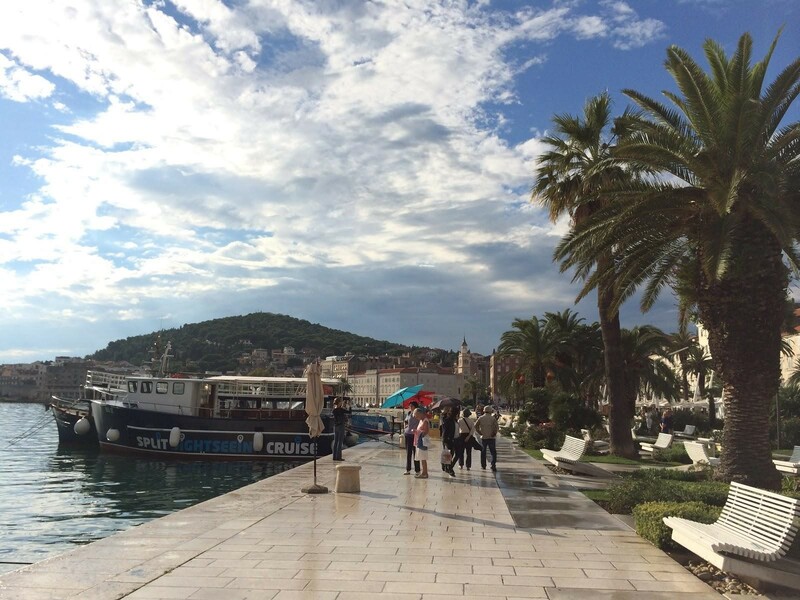 From a bustling waterside promenade and well preserved castle, to twisting streets full of busy cafes, restaurants & shops, Split had energy and a dose of sophistication bursting from its historic buildings. 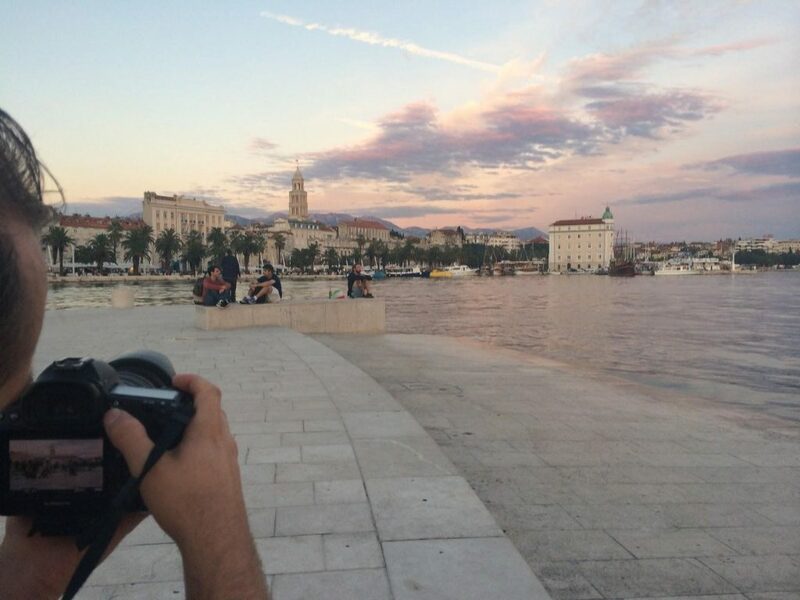 Naturally, we were on the search for the best ways to film the city so up we went. Marjan Hill is a park popular for running, concerts, weddings and of course, sweeping views of Split, where the mountains meet the sea. The steps up continued and I found myself wishing I were on a bike to get up to the top faster. But on we charged and we were rewarded with hitting the peak at magic hour, when Split was bathed in rosy, dewy light of the setting sun. But there were more mountains to climb, and the island of Brač beckoned. We met our fellow bikers, the rest of the intrepid crew that signed up for our VBT Bicycling and Walking Vacations tour, and we set sail via ferry for the first island. This vividly green island seemed to be built for biking–wide shoulders hugging mountain roads, idyllic small towns and roadside beaches so beautiful I frequently had to screech to a halt. 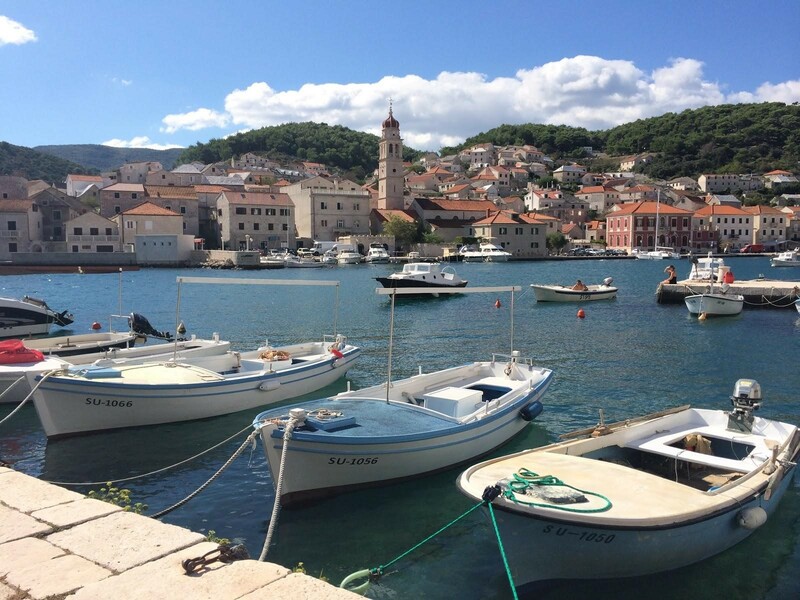 With the charming seaside town of Postira as our biking off point, we crisscrossed Brač, taking in mountain top vistas, and cobbled town streets and just the raw, glorious countryside. Biking everywhere was exactly what made this trip so special. Each experience was that much more enhanced because our blood was pumping and we were physically working to get ourselves there. It’s true that the harder the climb, the sweeter the view. 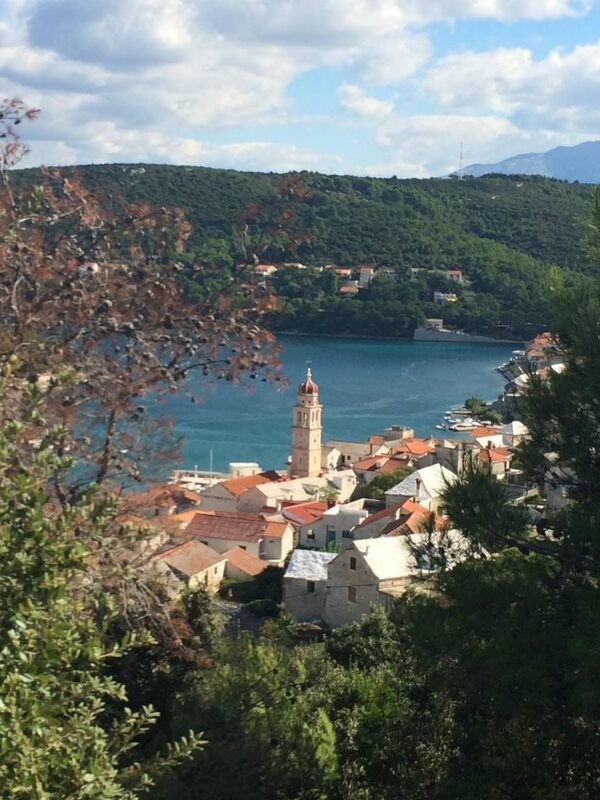 For me, no moment epitomized that feeling more than my bike ride up to Škrip, a small, mountain top town on Brač. Škrip was the bonus part of the first day’s ride. 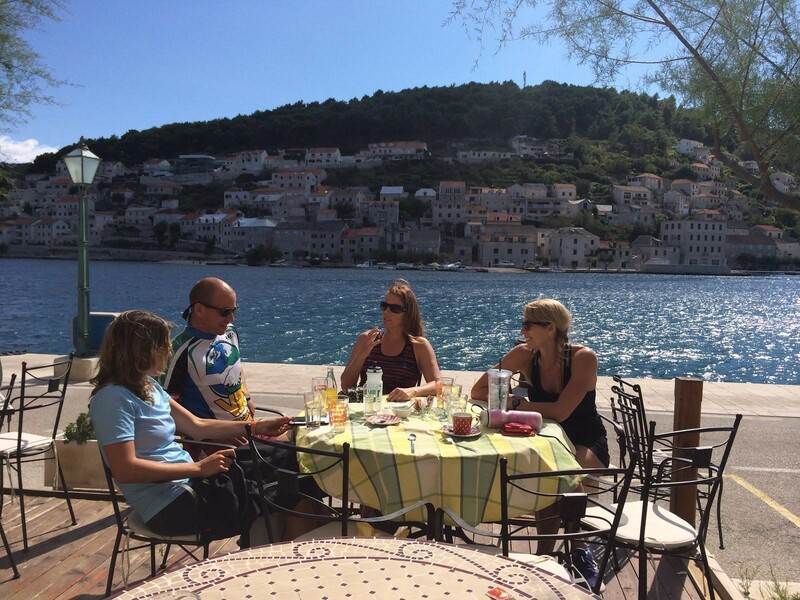 We biked a steep but jaw-droppingly picturesque route to and from the charming seaside town of Pučišća. The best part was getting to see Pučišća from above as you rode in — it is stunning from all vantage points. 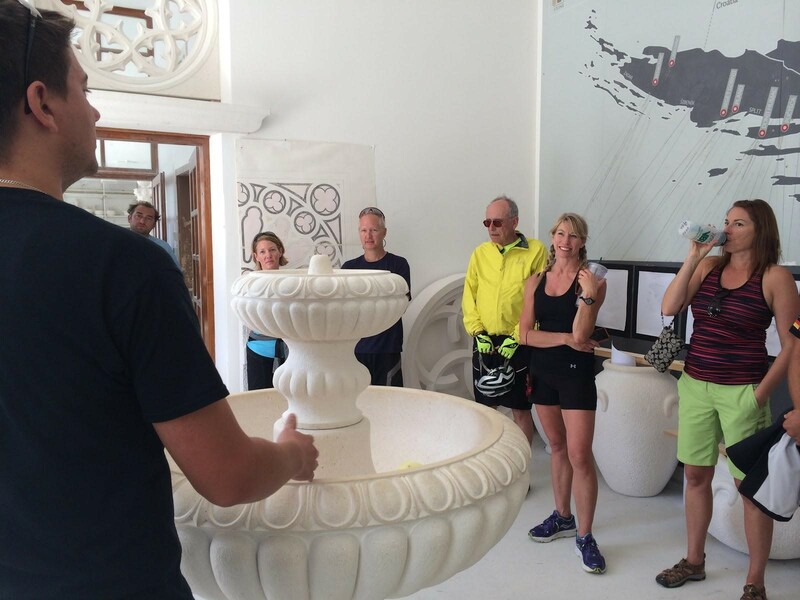 Upon our return, after a wholesome lunch and a very interesting tour of a marble carving school, we had the choice to bike an extra leg, the most challenging part we’d ever encounter on the trip. The leaders of our group were fit and experienced, and they told us in no uncertain terms that this was going to be tough, but it was completely optional. I chose to bike it. Something about the fresh air, the Mediterranean sun and the free feeling of focusing solely on pedaling, inspired me to tackle that last leg. It was hot, the air was dry but I was loving the burn as I pushed the road bike up the hill to Škrip. Though I did wonder if this hill would ever end; the farms, the waving locals and the views of distant islands gave me all the energy I needed to continue up. I saw the roadside sign for Škrip and the road magically leveled out. I had made it! With a euphoric feeling of victory, I sped along the ‘piece of cake’ road through a town of no more than three small buildings, ending in a church square with dappled with trees. I parked my bike, knowing the rest of the group would be there shortly and began to explore around as I regained my breath. A little, elderly lady jumped up and hobbled towards me. She and I had a few moments of hand-motions and a muddled mix of Croatia, English words, we finally settled on basic Italian were able to communicate. Her name was Luta, and she was waiting here to show the VBT group the homemade wine and olive oil that she produces at her home. 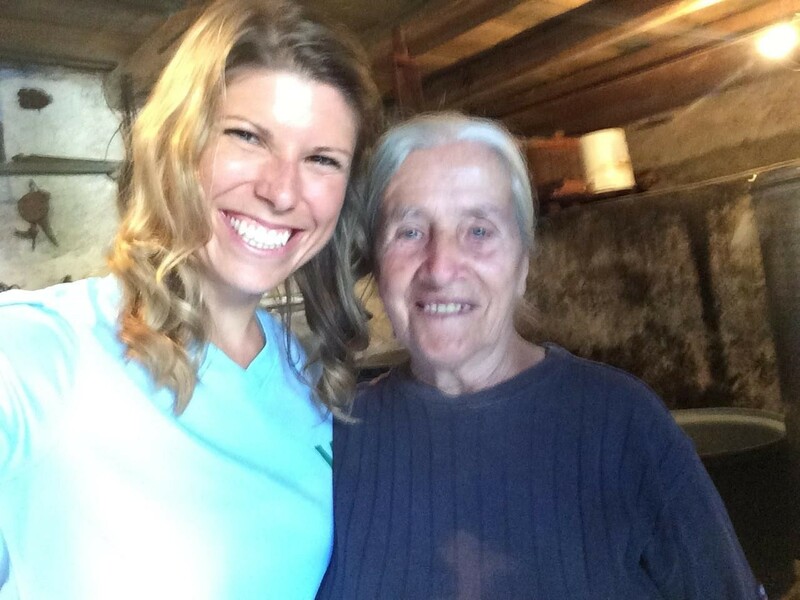 I translated her story to the group–she & generations before her have been making wine and olive oil in Škrip for the past 100 years. She nodded, pushing small plastic cups of wine and olive oil into our hands to taste. She made it all by hand with little frills or help, and her face lit up as we told her how delicious they were. 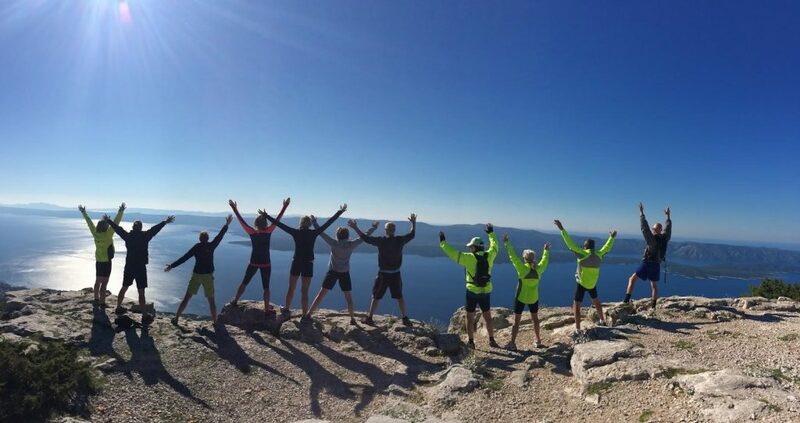 The handful of our group that had decided to push on and crest the hill to Škrip got the chance to meet the wonderful Luta and spend time in her home. Not only was this the best surprise at the end of a hill, but knowing that we had gone the extra mile on bike made this experience even more blissful. Being completely present made me love those few uphill rides the most because nothing beats the feeling of reaching the top.